For the last two years, while Vietnam has managed to attract investment capital into transport infrastructure, flashpoints have started to flare up in some BOT (build - operate - transfer) projects across the country. As economic growth accelerates, the demand for transport infrastructure is higher as a result. While the State fund is not enough to meet infrastructure investment needs, private financing is important for large projects, particularly recently adopted North - South Highway. At the cabinet meeting on November 8, 2018, Prime Minister Nguyen Xuan Phuc affirmed that the policy on BOT transport infrastructure construction is absolutely right and needs to be continued. Nevertheless, in the course of project implementation, many problems have emerged, making many investors hesitant in their investment, with some even having the intention of returning their projects to the State. Mr. Lam Hoang Linh, Director of Thai Nguyen - Cho Moi BOT Co., Ltd - the investor of Thai Nguyen - Cho Moi BOT Project, said that his company has to spend about VND16 billion (US$689.952) a month on average to pay bank loans and interest. As takings are not enough to pay the principal and interest, the Thai Nguyen - Cho Moi BOT Project reportedly has indefinite payback period. In addition to Thai Nguyen - Cho Moi BOT Project, many other projects of its kind face the same situation, including National Highway 10 BOT on La Uyen - Tan De (Thai Binh) section, My Loc BOT on National Highway 21B (Nam Dinh), National Highway 26 BOT from Khanh Hoa to Dak Lak; and Deo Ca BOT project run by Deo Ca BOT Company - the investor of two biggest road tunnels in Vietnam: Deo Ca and Hai Van, because the revenue is not enough to cover bank loans and interests. It had to ask for a project return to the State. Investors have many reasons to blame BOT projects for sending their business to the wall. The primary reason is attributed to shortcomings in issuing regulations on toll collection. Thus, in less than two years, the Ministry of Transport has changed regulations on traffic tolls three times. The peak of these shortcomings is the regulation that project investors are not allowed to increase road-use fees although this is a clause of the BOT contract signed with competent authorities. Thus, the BOT toll rates are bound while lending rates are squeezing investors. Besides, the significant difference in actual lending rates and regulatory rates under the BOT contract if they do not have their lending rates revised by credit providers. This is also a disadvantage to investors. Transport Deputy Minister Nguyen Nhat also said that the Ministry of Transport is managing 62 BOT projects (not including those stopped under Resolution 437/NQ-UBTVQH14 of the Standing Committee of the National Assembly). Up to now, 55 BOT projects have final settlement value agreements. At present, the Ministry of Transport is negotiating with investors to reduce road-use service prices for 39 projects. 16 projects with low toll rates and three highway projects that have little impact on costs of investors are not revised down toll rates. Four projects are also not reduced toll rates because of their low vehicle density. He said, disputes concerning road toll reduction in some BOT projects have been agreed by the Ministry of Transport and investors based on the guidance of the Ministry of Finance, the price index and the financial plan in which road tolls will be revised once every three years with the limit of each hike capped at 18% as soon as competent authorities approve. 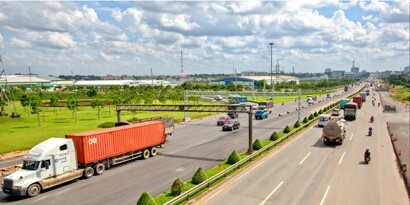 Mr. Nguyen Danh Huy, Director of the PPP Bureau under the Ministry of Transport, said, based on current regulations, the Ministry of Transport is responsible for issuing traffic toll rates for commercial road construction investment projects. When the Ministry of Transport was yet to issue Circular 35, the Circular 159/2013/TT-BTC of the Ministry of Finance stipulated that once every 3 years from 2016 the road-use fee will be reviewed and adjusted. Currently, all provisional BOT contracts signed with investors include such regulations. Nonetheless, he said that the Ministry of Transport is considering revising Circular 35 to remove the upper limit of service charges for expressway projects, BOT projects with alternative traffic routes which traffic users can use instead, and market-based road tolls. If operators introduce high rates, traffic users will not use their roads, and vice versa. Authorities only control ceiling prices for single-track projects. Experts said that, at present, most BOT road projects which are charging traffic tolls are restored and upgraded from existing roads. Thus, even the restriction imposed by Circular 35 is lifted, investors are also unlikely to benefit from this policy change. In fact, these difficulties are beyond the control of investors and the Ministry of Transport. If authorities fail to provide timely support and settlement measures, many BOT projects will become a burden for investors.